Douglas "Doug" Warren Potter, 70, died peacefully in his sleep on Sunday December 17th, 2017. He was born December 27th, 1946 to his parents, Elmer and Rita (Atkins) Potter in Mt. Clemens Michigan. Doug volunteered for the US Army in 1966 where he served until 1969. He then went on to get his Associates degree in Business from Macomb County Community College. He worked as a guard for National Bank of Detroit for 25 years. Doug loved to stay active. You could find him volunteering at church, traveling with his family, playing bingo, fishing with his son Jeff, visiting family and loved ones. Doug made friends easily and could often be found chatting with friends. 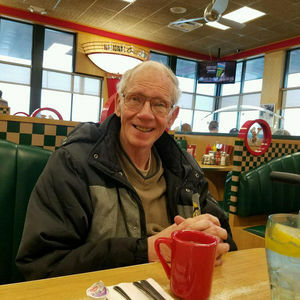 He was a lifelong Minnesota Vikings fan and enjoyed watching them on Sundays. Doug loved going out to eat (especially if it was a coney island) and watching the news. Doug is survived by his sons Tim and Jeff, grandchildren Benjamin and Gabriel, his brothers, Paul and Martin, and his sister Linda, as well as many nieces and nephews. A memorial service will be held at the First Congregational Church of St. Clair on Saturday, January 6, 2018 at 11am located at 300 Adams St, St. Clair, MI 48079. I am so sorry to hear of Doug's passing. My favorite memory of him is his great prayers he always gave before Thanksgiving and Christmas Eve dinner. Our condolences to you Tim and Jennifer! !